Cuban dissident blogger Yoani Sanchez says she has been granted a passport after years of being denied the right to travel abroad. Ms Sanchez, who has criticised the Cuban government in her prize-winning blog Generation Y, announced the development on her Twitter account. However, she said she was disappointed that her fellow activist, Angel Moya, was still denied a passport. The move comes after Cuba eased travel restrictions for its citizens. Ms Sanchez, 37, rose to prominence when she wrote about life in Cuba, emailing her blog entries to friends abroad to publish online. 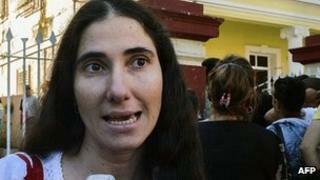 Her writing led to her arrest last October as she prepared to cover the trial of politician Angel Carromero. "Incredible! They called my house to tell me that my passport was ready. They just gave it to me," Sanchez tweeted. "Now the only thing left is to be able to board that plane." She added: "I am both happy and sad; on the one hand, I have my documents to be able to travel, but many of my friends like Angel Moya, are not going to be allowed." Ms Sanchez has said she was denied the right to travel 20 times under Cuba's old travel law and doubted she would get a passport under the new ones. Cuba recently ended the need for exit permits, meaning a passport is the only document needed to travel abroad. Queues outside Havana's immigration offices have grown longer than ever as Cubans rushed to apply for their first passport. Havana imposed the restrictions soon after the 1959 revolution to halt a mass exodus of the island's most talented people to the US. The move was widely criticised outside the island, and much complained about within. Correspondents say that by making it easier to travel, the authorities are gambling that more Cubans will work and study abroad then bring their money and expertise back to the island. Some restrictions, however, do remain in place. The new travel law refers to "preserving the qualified workforce" which officials say includes athletes and "vital" professionals as well as Communist Party leaders. Could exit permit change speed up reforms in Cuba?